Here is a small visual basic script that will delete all files in a folder older than 7 days with a specific file extension. I use it to clean out old spam that’s been archived on our exchange 2003 mail server by the IMF (intelligent message filter). I use task scheduler on the server to run the task once a day. I have added a few options that are commented out. In vb script this is done with a apostrophe ‘ so just remove to make it active. 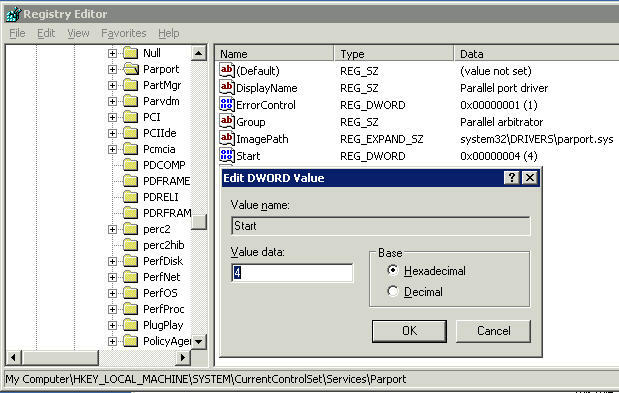 I fixed this error by disabling the the parport.sys driver in the registry as I could not see it in device manager. 2. 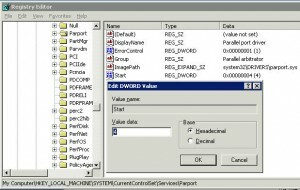 Right click on Start and select modify and change the value to 4 disabled. I completed a fresh installed of windows server 2003 at my office today and thought I could complete the configuration later at home. I arrived home and tried to connect but realized I forgot to tick the check-box “Enable Remote Desktop on this computer” under system properties, remote. To avoid driving back to the office (about a 100kms) here is a tip, you can enable it via the network registry. 3. 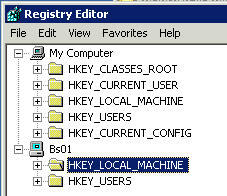 From select computer enter the computer name and click ok. You should now see your computer. Now you should be able to connect, if not you may need to restart the remote computer (I did not need to). 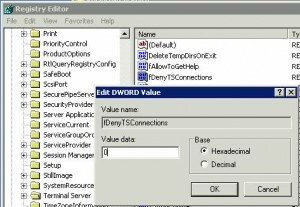 To do this open a command prompt Start -> Run enter “cmd” and click ok. At the command prompt type in “shutdown -m \\bs01 -r” the -m is computer name and the – r is reboot. To capture the ip addresses open Wireshark select capture, options from the menu. I only want traffic that is not local so I used this capture filter “not src net 192.168.5.0/24” and started the capture. Now that I can see the ip addresses what now? In my case I blocked the network that contained the ip address for tcp port 3389 on a Cisco router. How is my VMWare disk is provisioned? Here is the simplest way to check how your VMWare disks are provisioned. 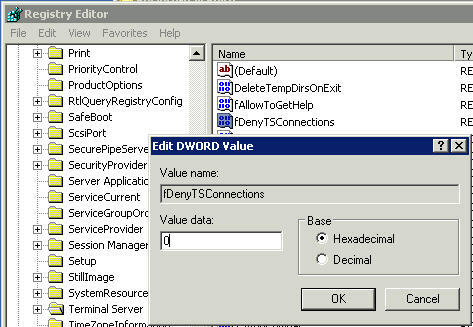 Right click on your virtual machine and select edit, next select the disk you want to check. On the upper right under Disk Provisioning you will see Type: Thick Provision Eager Zeroed, Thick Provision Lazy Zeroed or Thin Provision. 1. Click on New Mail Message (or reply / forward an existing message). 2. Click on the down arrow to the right of the Options button and select From. All messages will now have the From option, this will allow you to send messages from mailboxes you have permission for.